“Is this as good as you’re going to get?” It is a question posed to humanity by the flight of the Monarch butterfly. It will soon be time for the Monarchs hibernating in California and New Mexico to begin searching for mates in preparation for their migration toward the northern United States and Canada. This year may be different, however. This may be the year when populations have dropped so low that there will be too few encounters to sustain the species. So what does this have to do with human evolution? There are so many weird things afoot caused by climate change and human activity. However, we hear about them in fragments, and so far there has been no evidence of a general awareness of the peril afoot. Clearly this is what is needed, meaning a sea change in thinking, because leaders can do only so much. The real leadership needs to come from a collective awakening. Well, it could be that this is related. 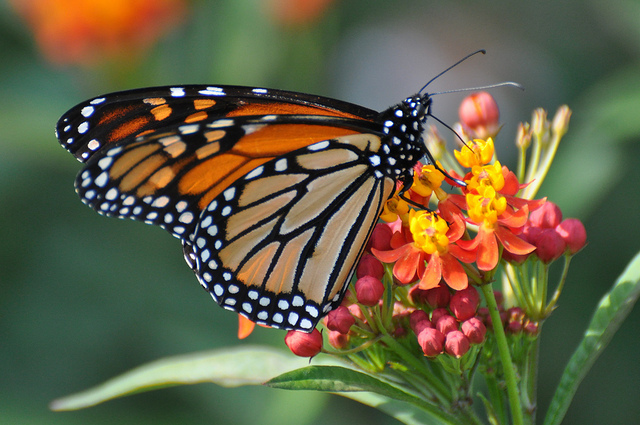 The Monarch may be just one species of butterfly, but it is a butterfly with an epochal story. For one thing, it is the only insect known to migrate thousands of miles annually. The imminent flight northward will be undertaken by a relay of several generations. 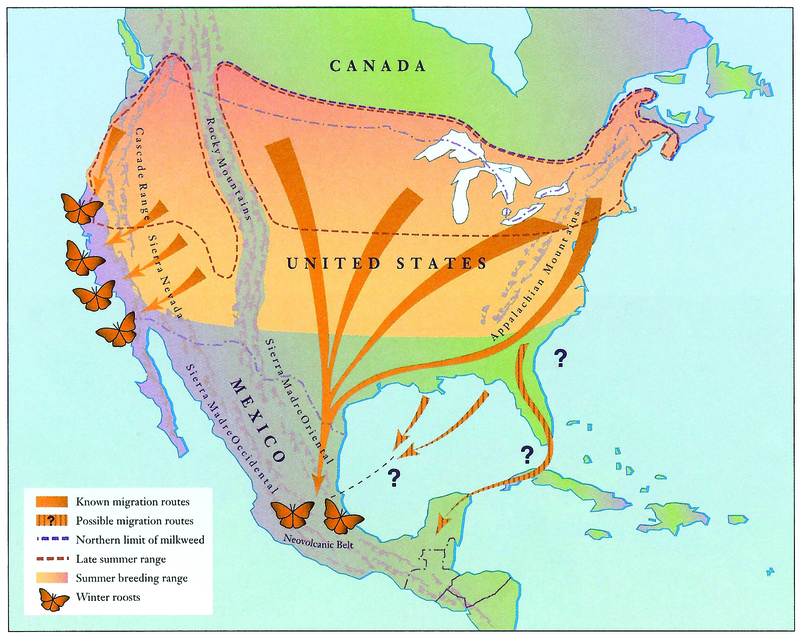 However, the return that was accomplished in the fall was undertaken by one generation of butterflies that had never before been where they were headed in Mexico and California. 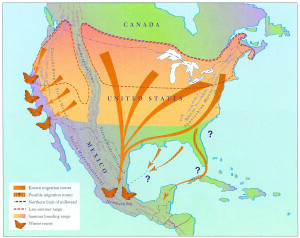 “Born to fly,” as National Geographic puts it, they went the distance–thousands of miles in the case of migration to Mexico–according to a guidance system that remains a mystery. Most of us have probably seen the Monarch’s dramatic arrival in Mexico and California only in photographs. As many as a billion once blanketed the oyamel fir trees on 45 acres in Mexico, branches breaking under their weight. Now their numbers have shrunk to about 35 million on 1.65 acres. The reasons for the drop in numbers everywhere are many. Their habitat is shrinking due to development and farming. Odd weather including late springs, flooding, drought, record-breaking heat, and also bitter cold have produced population crashes. And most important of all, the accelerating use of herbicides promoted by genetically engineered crops is wiping out milkweed on which the Monarch caterpillars feed. Yes, I am. I mean consider that if there is a way in which we might be blessed by a warning from one of the species that share the planet with us, it would come from one that is exquisitely beautiful, that embodies qualities akin to the courage, tenacity, and genius we value in ourselves, and that also represents an evolution–or the possibility of an evolution–that we may aspire to. So let’s follow the trail. The female Monarch lays eggs on the milkweed. Those eggs hatch into baby caterpillars that eat the milkweed nonstop. The milkweed has a bitter taste, which keeps the caterpillars safe from predators. Then the caterpillar attaches to a leaf and creates a pupa or chrysalis. Over the next 10 days, the caterpillar begins to disintegrate, to liquefy really, and the butterfly forms within. We have come to understand the process as metamorphosis. And over the thousands of years of humanity trying to understand itself and to grow, metamorphosis has been taken to heart as a form of guidance and comfort. In art and literature, the wings of the butterfly are associated with the transforming spirit of young love, heroic sacrifice, transcending death, and the rebirth of the soul. Unlike moths, butterflies navigate by the sun. They are guided by the light, so to speak, and we have aspired to that as well. 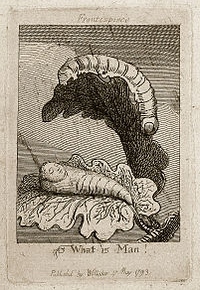 For the frontispiece of a book he published in 1793 (For Children: The Gates of Paradise), poet William Blake etched the image of mankind as a pupa awaiting transformation. With the image of the Monarch in mind, the idea emerges that we aren’t anything like done in our evolution, and all the hazards afoot suggest that we get moving. Much of this understanding about the universe of the chrysalis is probably at a subconscious level. However it lives in our belief as individuals that we have the opportunity to fulfill potential; to turn our lives around if we get off track; and rebuild, create, correct, and improve if we have the time and the will. What seems to be coming up is that human will, like that of the Monarch, needs to mobilize soon. The question is how much time we have. I, for one, will be watching the story of the Monarch not only for its own sake but for what it means to us as a country. As a symbol of transformation, it could be serving as a messenger. Time may be running out for the Monarch butterfly. And if this beautiful creature disappears at least in part because of what we have done to its world, we will at the very least have lost a great teacher–one that reminds us that our own wings are not yet in sight. So beautifully put. You might enjoy Barbara Kingsolver’s Flight Behavior. . .